Hu, who dined Tuesday night at the home of Microsoft Corp. Chairman Bill Gates, was invited to tour Boeing Co.'s Everett plant on Wednesday, just days after Chinese officials confirmed a commitment to order 80 Boeing 737 jets in a deal valued at $5.2 billion at list prices. The order has yet to be finalized, and airlines typically negotiate discounts. Hu's Thursday summit with Mr. Bush is expected to cover a broad agenda, from China's much-criticized currency and other trade policies, to its aggressive search for oil and its positions on the developing nuclear programs in Iran and North Korea. Hu began his American visit Tuesday in Everett, about 30 miles north of Seattle, where he was greeted by a local kung fu club and a handful of ribbon dancers from a Seattle elementary school. He also met government and business leaders, including Gov. Chris Gregoire and Starbucks Corp. Chairman Howard Schultz. Hu told Gregoire he didn't choose Seattle simply because it's the closest major U.S. city to China. "It is also because your state enjoys very good cooperative relations with my country," Hu said. Members of the spiritual movement Falun Gong, condemned by the Chinese government as a cult, staked out all four corners around the hotel Tuesday to protest treatment of the movement's followers in China. 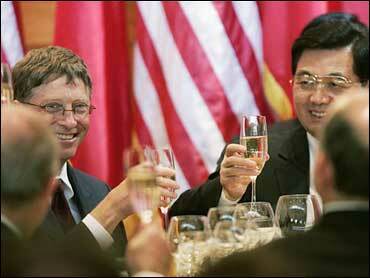 Following the meeting at Microsoft, about 100 guests were invited to Gates' home for a dinner that Gregoire hosted. The guest list included executives from Costco Wholesale Corp., Weyerhaeuser Co., Boeing and Amazon.com Inc.